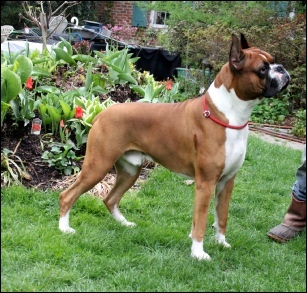 Although the Kennel at Jacquet Boxers (see below for the reasons) has been closed since 2010, I've worked closely with a number of other Boxer Breeders to carry on the Jacquet Boxer line. With my close cooperation and guidance, Jacquet Boxers are still being bred and the line is being carried on with my approval albeit not at the same level as it was previously. The Jacquet Boxer line took me more than 40 years to develop – it was my life's work after all- and I didn’t want to see it disappear as many of the great kennels of the past have done. The Jacquet Boxers record is unsurpassed and probably will never will be beaten. The reason for this has to do with the soundness of the dogs, their fine temperament, intellegence, and excellent conformation. Anyone who has owned a Jacquet Boxer will tell you what a joy it's been and how their lives have been so enhanced by the ownership. I receive calls weekly from first, second, third and even fourth generation owners who own or have owned our boxers and are looking to own one again. It's for this reason that I want the line to continue and prosper and I know with my guidance and help this can be achieved. Loseby lives with us in the house and and is our joy and comfort. He’s smart, obedient, and loving. He loves to play, amuse us and welcomes all visitors with great enthusiasm. His favorite game is frisbee which we play whenever weather permits. 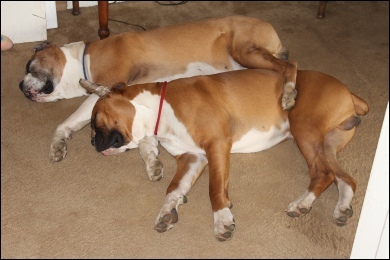 We simply can’t imagine living without a Boxer and he has all of the very best of the Jacquet Boxer traits. Loseby came to us through the kindness of our friends Ned, Doreen and their daughter. On the far right, Loseby as a puppy sleeping with his father Jacquet’s Kepler. Kepler was 12 then and had been our house dig for all of those years. He taught Loseby everything he needed to know and that’s how Loseby turned out to be such a wonderful dog! WHY DID WE CLOSE THE KENNEL?